As Iraq and Afghanistan fade from memory, North Korea has entered the U.S. imagination as the latest threat to national security. Alongside hysterical warnings of impending attack, many foreign policy analysts argue that events on the peninsula reflect an emergent rivalry between China and the United States. There is solid evidence behind this case. Tensions on the Korean Peninsula have come on the heels of the Obama administration's "Pacific Pivot," a large-scale effort to redirect U.S. military and diplomatic resources from the Middle East to East Asia. The United States has often admonished China for its inability to restrain the latter's border ally and dependent. Recent news that the Pentagon will fund 11 new missile defense silos to be placed on the west coast of the United States ostensibly signals that the United States has the material force to back up its threats. And yet we must take a macro-perspective on the fundamental organization of the international regime. Does China's ambivalence toward America's sanctions regime in North Korea imply a challenge to the broader international order? If not, then the supposed rivalry between the United States and China—at least as far as North Korea is concerned—may have little significance. Indeed, it is not rivalry in the classical sense. The real lesson to be learned from North Korea is instead that the Chinese bureaucracy is unwilling to take on a crisis with the potential to escalate. The Chinese Communist Party's actions over the past months demonstrate its essentially conservative nature. In the heyday of the Mao era, from the People Republic's founding until the late 1960s, Chinese revolutionary leaders would have likely defended North Korea's provocative rhetoric. Indeed, North Korea's very existence is due to China's willingness to fight for communist insurgents even at the risk of its own regime stability. At the outbreak of the Korean War, the Communist Party had only just won power and was already facing the domestic problem of stabilizing a country and an American superpower harassing it. Although the war ended up inflating its international position, the back-and-forth tug across the Korean Peninsula between the UN forces and the People's Liberation Army by no means guaranteed a favorable outcome. The current bureaucracy strikes a figure far less imposing than that of the Great Helmsman Mao. Over the past months, China has not supported North Korean belligerence. To the contrary, it has joined the United States and South Korea in crisis containment, and the Chinese Communist Party supported tightening sanctions in response to North Korea's missile tests. On April 6th, President Xi Jingping said that "no one should be allowed the throw a region and even the whole world into chaos for selfish gain." China has demonstrated its willingness to participate in "unremitting efforts to properly handle relevant issues." Although the United States has threatened to increase its military presence in the Pacific, Secretary of State John Kerry has also declared the North Korean crisis to be an opportunity for increased dialogue and cooperation between the United States and China to curb North Korea. 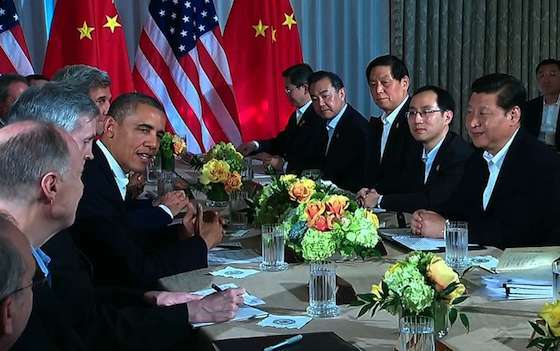 President Barack Obama approvingly noted that China is "recalculating" its policy toward North Korea. China's actions have not contradicted Obama's observation. According to an official who spoke on condition of anonymity to the International Business Times, Chinese envoy Wu Dawei "made it clear" on a recent trip to South Korea that "China will not accept North Korea as a nuclear-armed state." Chinese officials threatened North Korea with an end to economic aid if plans for another nuclear test do not change. The Bank of China has cut off business relations with the Foreign Trade Bank of North Korea, and Chinese customs inspections have increased. China has openly indicated not its hostility to U.S. actions, but rather its alignment and cooperation. Beijing has begun to cautiously participate in, and thus legitimize, the international institutions and mechanisms that ground the present international regime. In arguing that a rivalry between the United States and China does not exist, I am not presuming an opposition between peace and conflict. Neither of these states, nor any other, has ever demonstrated any true commitment to peace. There will be efforts by China to increase its relative power in the world. Its maneuvers in Africa and its increased military spending will most likely proceed barring an economic downturn. Such moves do not, however, imply a desire by Chinese leaders to increase China's absolute position by radically changing the existing system. Regime stability does not necessary mean peace. Rather, it may mean that the present organization of violence will not be altered by the Great Powers. The contrast with an earlier era of Realpolitik serves as a useful reminder of how far the interstate system has come. Whereas Germany's hegemonic pretensions of the late 19th and early 20th centuries led it to adventurist policies, the Chinese have taken no comparable actions. Indeed, the present crisis makes it clear that even the possibility of serious escalation will be limited. It has been stated that China's very minimalism presages greater future ambitions. As the argument goes, China recognizes the United States' still-dominant position and understands that any hasty movement would bring swift reprisal. This argument holds that China is presently building capacity in order to translate it into classical power balancing at a latter date. And yet this is an unproven theory. An interpretation more in line with the evidence is that China's actions are within and not against the world order. The standoff between the United States and its allies and North Korea will likely to continue. Crises tend to persist long beyond their relevant timeframe. In terms of how to manage the results in the Korean Peninsula, states will have minor, but predictable, disagreements—internal struggles among elites who are in fundamental consensus. The overall tenets of the current world system—including neoliberal economics and the containment of perceived sub-systemic threats—are tenets all the Great Powers hope will persist. The crisis in North Korea does not demonstrate the end of consensus, but rather its very strength. If America's rhetoric seems to goad China toward renewed rivalry, China does not want to enter the ring. Kailash Srinivasan is a PhD student in Political Science at Ohio State University specializing in international relations, social movements, and contemporary warfare. He has a Master's Degree in International Relations from the University of Chicago.